Astronauts flying aboard shuttle Endeavour in September 1995 called themselves the Dog Crew, a lighthearted twist to their complicated mission to launch and then retrieve a pair of satellites. A hotrod United Launch Alliance Delta 2-Heavy rocket, souped up with bigger solid-fuel boosters for added thrust, roared from Cape Canaveral's pad 17B at 7:34 a.m. EDT (1134 GMT). The 12-story blue and white rocket raced to space, achieving an initial orbit 100 miles above the planet just nine minutes after liftoff. After coasting for 40 minutes over Africa and the Indian Ocean, the second stage re-ignited its engine for a two-and-a-half-minute boost, then dropped away to enable the third stage to propel Dawn out of Earth orbit high over Australia. Sixty-two minutes into the $425 million mission, the 2,685-pound spacecraft was cast free from the Delta vehicle, marking the 76th consecutive successful launch for the workhorse rocket. Dawn unfurled its giant solar wings, stretching 65 feet tip-to-tip, and then phoned home to mission controllers at 9:44 a.m. EDT. "Dawn has risen, and the spacecraft is healthy," said the mission's project manager Keyur Patel of NASA's Jet Propulsion Laboratory. Built by Orbital Sciences and equipped with U.S., German and Italian science instruments, Dawn is headed out into the solar system on a reconnaissance mission to visit a massive asteroid and a "dwarf planet" believed to harbor water. 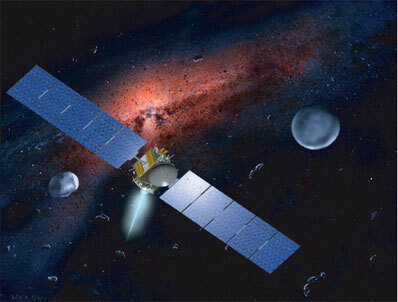 Picking up a gravity sling-shot from Mars in February 2009 to bend its trajectory, Dawn will venture into the asteroid belt to rendezvous with Vesta in August 2011 and orbit around the rocky body for nine months. Then it will break away from that asteroid and travel further to the small world called Ceres and also orbit that tantalizing object beginning in February 2015. "Dawn will be history's first mission to go out into the solar system, orbit and explore a distant body, and then go on to a totally different celestial body and explore that one," Patel said. "To do all that you need a spacecraft with a lot under the hood." Dawn's ion thrusters, derived from the engine successfully demonstrated on NASA's Deep Space 1 technology pathfinder craft, enables the unprecedented science project to be attempted. "In the end it is about the science," said Patel. "What we find when Dawn gets to Vesta and Ceres will re-write the history books on the beginning of our solar system. But how we get there is almost as remarkable, 1.8 billion miles to Vesta, months flying around it performing science adjusting our orbits as we go. Then we travel another billion miles to Ceres where we do it all over again. That is a lot to ask of a beam of blue light." "It really is the key to why we can undertake such an ambitious and potentially rewarding journey in which we're going to be visiting some of the last unexplored worlds in the inner solar system," said Marc Rayman, Dawn project systems engineer. "The ion propulsion system is 10 times more efficient than conventional propulsion, so it allows us to undertake missions that are really far beyond the capability of conventional systems. "It works by ionizing, or giving an electric charge, to atoms of xenon gas and then it uses a high voltage to shoot these ions through this metal grid at very high speed, up to almost 90,000 miles per hour. And the action of the ions leaving the thruster causes a reaction that pushes the spacecraft in the other direction. ... It really does emit this cool, blue glow like in the science fiction movies." Dawn's ion propulsion system has many remarkable traits, but producing quick bursts of speed is not one of them. In fact, it would take Dawn four days to accelerate from zero to 60 mph. The thrusters will fire continuously for days, weeks and even months, accumulating over 2,000 days of operations during the eight-year mission and allow the whisper-like thrust to gradually build over time to generate high speeds. "Hold a piece of notebook paper in your hand. The weight of that paper pushing against your hand is the same as the thrust provided by one of Dawn's ion engines -- at full throttle I might add," said John Brophy, Dawn's ion propulsion systems manager. "If you had an ion engine firing here on Earth, it would not be able to push a skateboard across a sidewalk!" "Ultimately we can achieve fantastically high speed," Rayman said. "Over the course of its mission, Dawn will change its own speed by the same amount as the entire Delta 2-Heavy launch vehicle with its nine solid motors, it's first stage, plus its second stage, plus its third stage. It's what I like to call 'acceleration with patience.'" The three basketball-size ion engines weigh 20 pounds each, and Dawn is carrying 937 pounds of xenon fuel to feed the thrusters during the mission. The fuel efficiency promised by the revolutionary propellant system means Dawn can increase its speed by 5,500 mph over the course of a year but burn only 15 gallons of propellant. "From such a little engine you can get this blue beam of rocket exhaust that shoots out at 89,000 miles per hour. The fuel efficiency of an ion engine is an order of a magnitude higher than chemical rockets and can reduce the mass of fuel onboard a spacecraft up to 90 percent. It is a remarkable system," said Patel. Getting the spacecraft built and launched has been beleaguered by setbacks. The mission experienced a number of hurdles, including outright cancellation of the project in March 2006. After a heated controversy, NASA restarted the mission less than a month later. 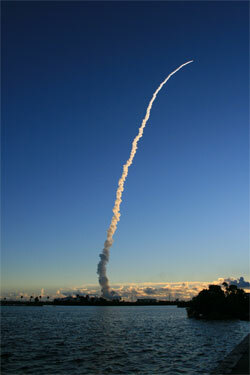 And even this summer encountered several launch delays. "It has been quite an emotional roller coaster," said Dawn principal investigator Christopher Russell, who began designing the project more than a decade ago. "There were some days I didn't think we were going to make it. But we never stopped trying." Scientists want up-close studies of Vesta and Ceres to learn more about the processes and conditions during the solar system's formation four-and-a-half-billion years ago. The spacecraft will orbit at increasingly lower altitudes above the two diverse objects during multi-month visits to determine the composition, internal structure and evolutionary history of the bodies. "Visiting both Vesta and Ceres enables a study in extraterrestrial contrasts," said Russell. "One is rocky and is representative of the building blocks that constructed the planets of the inner solar system. The other may very well be icy and represents the outer planets. Yet, these two very diverse bodies reside in essentially the same neighborhood. It is one of the mysteries Dawn hopes to solve." Vesta is believed to be solid rock. The oval-shaped object has an average diameter of approximately 320 miles. On the other hand, Ceres could have water or ice beneath its rocky crust. This "baby planet" has an average diameter of about 600 miles. "This is comparative planetology at its best," said Dawn program scientist David Lindstrom. "We are going to the two largest asteroids, but they are very different. Vesta is a very dense, igneous object from which we get plentiful meteorites. About 5 percent of the meteorites that fall on Earth come from the asteroid Vesta. "We know that some of these rocks are (lava-like) basalts that crystallized 4.5 or (4.6) billion years ago, within a few million years of the earliest dated materials in the solar system. So we truly are going back in time, back to the dawn of the solar system. "In contrast, Ceres, which is the largest asteroid and makes up about a quarter of the total mass in the asteroid belt, has much lower density indicating substantial amounts of ice. We have no known meteorites from Ceres so there's even more to learn by going to Ceres."